For other people named John Gagliardi, see John Gagliardi (disambiguation). American football, referred to as football in the United States and Canada and also known as gridiron, is a team sport played by two teams of eleven players on a rectangular field with goalposts at each end. The offense, which is the team controlling the oval-shaped football, attempts to advance down the field by running with or passing the ball, while the defense, which is the team without control of the ball, aims to stop the offense's advance and aims to take control of the ball for themselves. The offense must advance at least ten yards in four downs, or plays, and otherwise they turn over the football to the defense; if the offense succeeds in advancing ten yards or more, they are given a new set of four downs. 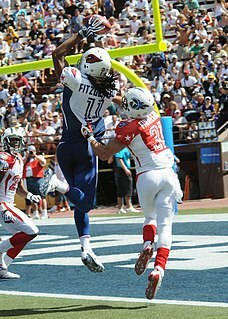 Points are primarily scored by advancing the ball into the opposing team's end zone for a touchdown or kicking the ball through the opponent's goalposts for a field goal. The team with the most points at the end of a game wins. The College of Saint Benedict (CSB), a women's college, and Saint John's University (SJU), a men's college, are private liberal arts colleges respectively located in St. Joseph and Collegeville, Minnesota, United States, near St. Cloud. Under CSB's and SJU's coordinate relationship, students at the two colleges have a shared curriculum, and access to the resources of both campuses. Collegeville Township is a township in Stearns County, Minnesota, United States. The population was 3,343 at the 2010 census. Trinidad is a Home Rule Municipality that is the county seat and the most populous city of Las Animas County, Colorado, United States. The population was 9,096 as of the 2010 census, up slightly from 9,078 in 2000. The estimate as of 2012 was 8,771. Trinidad lies 21 mi (34 km) north of Raton, New Mexico, and 195 mi (314 km) south of Denver. Trinidad is situated on the historic Santa Fe Trail. World War II, also known as the Second World War, was a global war that lasted from 1939 to 1945. The vast majority of the world's countries—including all the great powers—eventually formed two opposing military alliances: the Allies and the Axis. A state of total war emerged, directly involving more than 100 million people from over 30 countries. The major participants threw their entire economic, industrial, and scientific capabilities behind the war effort, blurring the distinction between civilian and military resources. World War II was the deadliest conflict in human history, marked by 50 to 85 million fatalities, most of whom were civilians in the Soviet Union and China. It included massacres, the genocide of the Holocaust, strategic bombing, premeditated death from starvation and disease, and the only use of nuclear weapons in war. St. Mary's High School is a private, Roman Catholic high school located in the Roman Catholic Diocese of Colorado Springs, Colorado, United States. St. Mary's colors are kelly green and white, and its mascot is the Pirate. The Carroll Fighting Saint football program represents Carroll College of Helena, Montana in college football. The team competes in the Frontier Conference, which is affiliated with the National Association of Intercollegiate Athletics (NAIA). The Carroll Fighting Saints football team began playing in 1920 and is one of the most successful programs in the NAIA division of college football. The program has won six NAIA Football National Championships and 40 conference championships, 14 while a member of the Montana Collegiate Conference and 26 as a member of the Frontier Conference. The team is currently coached by Mike Van Diest who in his 17th season at Carroll, has compiled a career record of 194– 36. His winning percentage of .8145 is the third highest of any head coach with at least ten seasons of experience in college football history, behind only those of Mount Union's Larry Kehres and Notre Dame's Knute Rockne. The Carroll College Fighting Saints plays their home games on campus at Nelson Stadium. 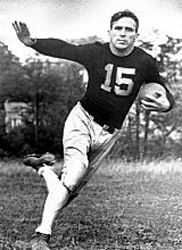 John Victor McNally, nicknamed Johnny Blood, was an American football player and coach. He was inducted into the Pro Football Hall of Fame as a player in 1963. The Saint John's Johnnies football program represents Saint John's University in Collegeville, Minnesota. They compete at the NCAA Division III level and are members of the (MIAC) Minnesota Intercollegiate Athletic Conference. From 1953 through November 19, 2012 John Gagliardi coached the Johnnies, having a 489–138–11 record over 59 years. The current coach is Gary Fasching, who was named to the position on December 28, 2012. The Minnesota Intercollegiate Athletic Conference (MIAC) is a college athletic conference which competes in NCAA Division III. All 13 of the member schools are located in Minnesota and are private institutions, with only two being non-sectarian. The Grambling State Tigers are the college football team representing the Grambling State University. The Tigers play in NCAA Division I Football Championship Subdivision (FCS) as a member of the Southwestern Athletic Conference. 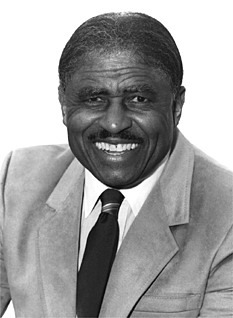 Eddie Gay Robinson Sr. was an American football coach. For 56 years, from 1941 to 1942 and again from 1945 to 1997, he was the head coach at Grambling State University, a historically black university (HBCU) in Grambling, Louisiana. Robinson is recognized by many college football experts as one of the greatest coaches in history. During a period in college football history when black players were not allowed to play for southern college programs, Robinson built Grambling State into a "small" college football powerhouse. He retired in 1997 with a record of 408–165–15. Robinson coached every single game from the field and was inducted into the College Football Hall of Fame in 1997. Robinson is arguably the most successful college football coach in FCS history and third most victories in college football history. Bethel University is a private, evangelical Christian, liberal arts university located primarily in Arden Hills, Minnesota. Founded in 1871 as a Baptist seminary, Bethel is currently a member of the Council for Christian Colleges and Universities and affiliated with Converge, formerly known as the Baptist General Conference. Bethel University enrolls 5,600 students in undergraduate, graduate, and seminary programs. These programs are composed of 90 majors in over 100 different areas of study, and are accredited by the Higher Learning Commission. Gagliardi, John. ; Riley, Don. (1984). Gagliardi of St. John's: the coach, the man, the legend. Wayzata, Minn.: J. Montpetit and R. Turtinen Pub. Co.
Murphy, Austin (2001). The Sweet Season: A Sportswriter Rediscovers Football, Family, and a Bit of Faith at Minnesota's St. John's University. HarperCollins. ISBN 978-0-06-019547-2. Collison, Jim (2001). No-How Coaching: Strategies for Winning in Sports and Business from the Coach Who Says "No!". Capital Books. ISBN 978-1-892123-72-5. Rajkowski, Frank. (2003). Gagliardi: road to the record. [St. Cloud, Minn.]: St. Cloud Times. Bostrom, Boz (2016). A legacy unrivaled: the story of John Gagliardi. Saint Paul, MN: Minnesota Historical Society Press. ISBN 978-1-68134-016-6. Johnny Nolan Robinson is a former American football safety. He played college football at Louisiana State University (LSU). The Gagliardi Trophy was first presented in 1993 to the Outstanding Division III college football player of the year by the Jostens Company and the J-Club of Saint John's University in Minnesota. Since that time, the award has become one of the leading collegiate football awards in Division III football, honoring excellence in athletics, academics and community service. The award is named for John Gagliardi, head football coach of Carroll College 1949 to 1952 and Saint John's University in Minnesota from 1953 to 2012. The trophy was presented by the Salem Rotary Club each year in Salem, Virginia until 2018. St. Cloud State University (SCSU) is a public university founded in 1869 above the Beaver Islands on the Mississippi River in St. Cloud, Minnesota, United States. The university is one of the largest schools in the Minnesota State Colleges and Universities system, which is the largest provider of higher education in Minnesota. A regional comprehensive university, SCSU has more than 14,000 students and nearly 110,000 alumni. Carroll College is a small, private, Roman Catholic, liberal arts college in Helena, Montana, United States. Carroll College is a top-ranked regional college and has earned national recognition for its academic programs. Carroll's colors are purple and gold. The school's sports teams are known as the Saints or the "Fighting Saints." Their speech and debate (forensics) team is known as the "Talking Saints." Joe Warren is a former American soccer player. Blake Elliott was the winner of the 2003 Gagliardi Trophy for academic and football excellence covering all of NCAA Division III. He graduated from Melrose High School in Melrose, Minnesota and Saint John's University. He owns several school, conference, and national records in NCAA football. In his senior year, he led Saint John's to the NCAA Division III Football Championship over previously unbeaten Mount Union College. After college, Elliott spent time with the Minnesota Vikings with a tryout. He never played professionally. James Monroe Christopherson was an American football player and coach. He played professional football for the Minnesota Vikings in 1962 and was the head coach at Concordia College in Moorhead, Minnesota from 1969 to 2000. He was inducted into the College Football Hall of Fame in July 2007. William Kevin Donley is an American football coach and former player. In 2018, Donley began his 40th season as a head coach in addition to the 1997 season which was devoted to establishing the football program at the University of Saint Francis. Donley was named head coach there in April 1997. The Saint Francis Cougars began play in the 1998 season, and 2018 marks Donley's 21st season since the program's inception. Edwin J. Saugestad was an American ice hockey coach. From 1958 to 1996, he was the head hockey coach at Augsburg College in Minneapolis, Minnesota. He led the Augsburg hockey team to three National Association of Intercollegiate Athletics men's ice hockey championships and six consecutive Minnesota Intercollegiate Athletic Conference championships from 1976 to 1982. At the time of his retirement in 1996, he ranked second in career wins in NCAA Division III history. He received the John MacInnes Award in 2002 for his lifetime of contributions to amateur hockey and the Hobey Baker Legends of College Hockey Award in 2007. As of 2010, he ranks 18th all-time among college men's ice hockey coaches with 503 wins. The St. Cloud State Huskies are the athletic teams for St. Cloud State University. The university is primarily a member of the Northern Sun Intercollegiate Conference (NSIC), and currently sponsors 18 NCAA Division II teams. SCSU also sponsors a women's Nordic skiing team through membership in the CCSA, as well as men's and women's Division I ice hockey teams that are members of the National Collegiate Hockey Conference (men) and Western Collegiate Hockey Association (women). The teams go by the nickname Huskies, and the school's mascot is a husky named Blizzard. The Carleton Knights football team represents Carleton College in college football at the NCAA Division III level. The program was started in 1883 and was very successful through the early 1960s, winning over 20 conference championships from 1895 to 1956. John Olaf Roning was an American college football player, coach, and athletics administrator. After he played end at the University of Minnesota from 1932 to 1934, Roning entered the coaching ranks. After a few years coaching in the high school ranks, Roning became the head football coach at Gustavus Adolphus College in 1939. He left in 1942 to return to Minnesota as an assistant and then was at North Carolina Pre-Flight. In 1951, Roning became the head football coach at Utah Agricultural College—now known as Utah State University—in Logan for four seasons and then at the University of Denver. He was the athletic director at the University of South Dakota from 1961 to 1971 and the second commissioner of the Big Sky Conference (1971–1977). Jacobi Melius Alton Christiansen was an American football and basketball player and coach. He served as the head football coach at Valparaiso University from 1929 to 1940 and at Concordia College in Moorhead, Minnesota from 1941 to 1968, compiling a career college football record of 175–92–15. Christiansen's 1964 Concordia team tied with Sam Houston State in the NAIA National title game. Christiansen is one of the few college football coaches to have coached in a stadium named after himself. The 1992 Carleton Knights football team represented Carleton College in the 1992 NCAA Division III football season. Bob Sullivan returned as the head coach, and Gerald Young was hired as the team's new defensive coordinator. The team compiled a 9–1 record and won the Minnesota Intercollegiate Athletic Conference (MIAC) championship, but lost to Central College in the first round of the Division III West Region playoffs. Joseph Francis Benda was an American football, basketball and baseball coach. He served as the head football coach at Saint John's University in Collegeville, Minnesota from 1930 to 1936 and 1941 to 1942. He also served as the school's men's basketball coach and baseball coach. 1 2 3 4 Press, The Associated (2018-10-08). "John Gagliardi, Winningest College Football Coach, Dies at 91". The New York Times. ISSN 0362-4331 . Retrieved 2018-10-08. ↑ "John Gagliardi's legendary college football career throughout the years". St. Cloud Times. 2018-10-08. Retrieved 2018-10-08. ↑ John Feinstein (2018-10-08). "John Gagliardi was nothing like a college football coach, and won more than any". Washington Post. Retrieved 2018-10-08. ↑ "John Gagliardi through the years: A football timeline - StarTribune.com". 2018-10-08. Retrieved 2018-10-08. ↑ Bob Sansevere (2018-10-07). "Bob Sansevere: John Gagliardi loved football; he loved people even more". Twin Cities. Retrieved 2018-10-08. ↑ Reusse, Patrick. "Mike Grant on John Gagliardi, 'the smartest man I've ever known'". Star Tribune. Retrieved 2018-10-08. ↑ Wells, Adam. "Winningest Coach in College Football History John Gagliardi Dies at 91". Bleacher Report. Retrieved 2018-10-08. ↑ "Johnnies get Gagliardi record 409th career win - D3football". 2003-11-08. Retrieved 2018-10-08. ↑ Finley, Bill (2003-12-21). "COLLEGE FOOTBALL; St. John's Completes Mission Improbable". The New York Times. ISSN 0362-4331 . Retrieved 2018-10-08. ↑ "Inductees - Football Players & Coaches - College Football Hall of Fame" . Retrieved 2018-10-08. ↑ "FTW Explains: Who was John Gagliardi and why was he so important?". For The Win. 2018-10-07. Retrieved 2018-10-08. ↑ Dennis Brackin (November 19, 2012). "St. John's coach John Gagliardi retires". Star Tribune . Retrieved November 19, 2012. ↑ "Relive John Gagliardi's Hall of Fame days". St. Cloud Times. Retrieved 2018-10-08. ↑ "Saint John's Mourns the Passing of Football Coaching Legend John Gagliardi". Saint John's University. 2018-10-07. Retrieved 2018-10-08. .
↑ "Football Coaching History". Carroll College Athletics. Retrieved 9 October 2018. ↑ "John Gagliardi - 2011 Football Coaching Staff - Saint John's University". The Official Athletics Site of St. John's University. Retrieved 9 October 2018. ↑ "John Gagliardi - Staff Directory - Saint John's University". Saint John's University. Retrieved 9 October 2018.